What Has the Titan Supercomputer Been Up To Lately? You Won’t Believe It. Scientists are simulating how cells communicate, which could eventually lead to ways to stop diseases in their tracks. What the top American machine lacks in raw power, it makes up for in efficiency. The M.O.J.O., an Android-based but TV-connected microconsole developed by gaming-peripherals manufacturer Mad Catz, will cost $250 when it goes on sale in December, the company announced today. That puts it near the high end of competing Android gaming devices, closer to the portable $300 Nvidia Shield than the TV-connected $80 GameStick or $100 Ouya. The M.O.J.O.’s website is now accepting preorders ahead of its Dec. 10 launch date, although the company said in a press release that the microconsole will only be available “in limited quantities” at that time. Although Nvidia has done all the work on Tegra Note, it will be localized and sold by various partners over the next few months. “I guess I gotta go buy a new one.” Smooth! The chipmaker plans to bring the effort to market in the first half of next year as part of its next-generation Tegra processor. In advance of its launch one week from today, the Nvidia Shield just got a $50 price drop. 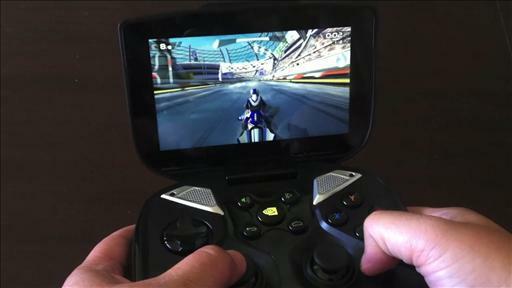 The Android-based handheld gaming console features a console-like controller, a five-inch screen and Nvidia’s Tegra 4 chip.